If you want to create a stylish splashback in your kitchen – or indeed bathroom – tiles are an affordable option that can be fitted on a DIY basis in order to add, colour, pattern or texture to a space. 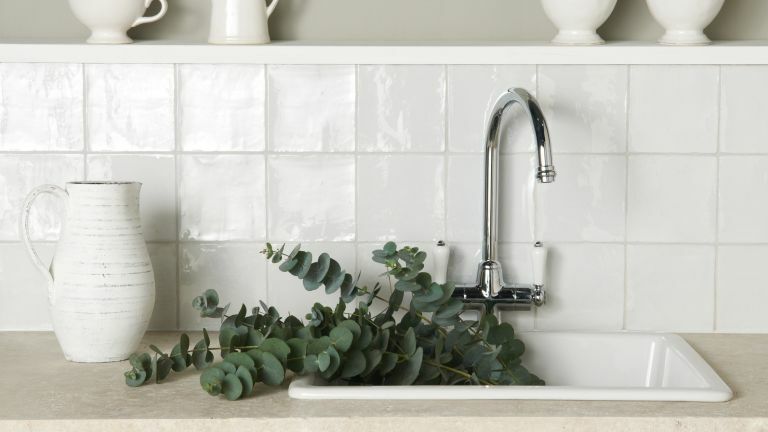 To start, decide where you want the tiled area to be and choose your tiles, then complete the task using our step-by-step guide to how to tile a splashback. Our video will be a helpful added bonus, too. Find more tips in our guide to tiling a wall, too. If you need some inspiration for choosing tiles that suit your space and style, check out our guide to choosing bathroom tiles and kitchen tiles. As with all tiling projects, taking the time to prepare is vital, so make sure to clean your wall area with soap and water and cover your kitchen worktops with plastic sheeting. Wait for the surface to dry before going any further. You may need to prime your wall and, in wet areas, you may need a waterproof adhesive, but check with the tile manufacturer for what’s recommended. Using a tape measure, measure a central line where your splashback will be and work out and mark a pencil line where each tile will fall to give you a guide of where to lay each one. If the area you’re tiling has a plug socket or switch on it, you’ll need to measure where this sits on the tiles before you start laying and make the cuts as necessary using a tile cutter. Make sure to select an adhesive to suit your tile choice, such as BAL Max-flex Fibre in white, which works with mosaic tiles. You can use either ready-mixed or a cement-based adhesive, which you’ll make up yourself according to the packaging instructions. Remember to use a waterproof adhesive for wet areas by sinks or in shower recesses. Start at the bottom and apply the adhesive using a notched trowel. Apply a generous layer and creates grooves, or notches, in the same direction, which will help the tiles to stick. Make sure to do a small area at a time – no more than one metre squared – as the adhesive will set quite quickly. Carefully push the tile into the adhesive and place a tile spacer along each edge. If you’re using mosaic sheets that are designed to fit together, you won’t need any spacers. Repeat the steps until you’ve covered the splashback area and wipe the surface to remove any glue residue, using a clean cloth or sponge, as you go. Once you reach the edge, you may need to cut the tiles using a specialist cutter. A tile scribe can be used on thin tiles, but you may need an electric or manual cutter for thicker or more complex cuts, such as right angles or curves. A manual cutter is used to achieve straight lines. When dealing with thinner tiles, it's often best to use a tile scribe. To achieve right angles, curved edges and to cut through thicker tiles – for example, porcelain or natural stone – you'll want to use an electric cutter. Leave the tiles for a few hours – or even overnight – to set and then you’ll be ready to apply the grout. Mix the correct type of grout for your tile type in a bucket. It’s best to do a little at a time, as the grout sets quickly. Leave the mixed grout for two to three minutes and then mix again before applying. Once mixed to a good, thick consistency, scoop the grout onto a grout float and press it into the gaps by holding the float at a 45 degree angle and slowly, but firmly spreading it onto the surface. Wipe the tiles with a clean, damp sponge regularly to remove excess. Don’t over wet at this point as this will weaken the finished grout. After you’ve covered the whole area, leave it for about an hour and wipe it down again to ensure a clean finish. You can then apply sealant along the edges to make sure your new surface is watertight before admiring your beautiful new tiled feature.